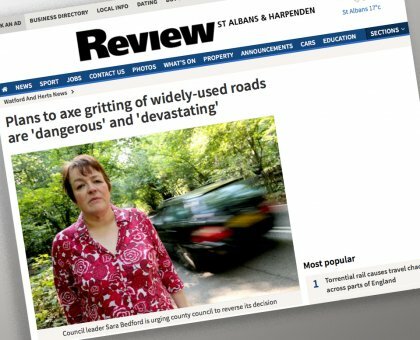 An article has been released on the St Albans Review website and then picked up by the BBC website highlighting the potential reduction of road and pavement gritting within Hertfordshire. We feel it’s important for our customers to be aware of the decisions being made in case it impacts them, and therefore if they need to make alternative arrangements. "Across Three Rivers a number of important roads will be left in a possibly dangerous state over the winter. I am calling on Hertfordshire County Council to reverse these devastating and dangerous cuts, to ensure residents can travel safely during the winter months." Read the reduction to road gritting article in full.